Some of you might recall that I took on the 4 simple goals before 2013 challenge set out by the ladies at A Beautiful Mess. One of those goals was to Look inside, out, to reevaluate what I had rather than coveting the latest and greatest and to draw on the things I already owned to subtly, or not so subtly change-up our home decor. The plan was to not spend a penny, on that front I failed, I did buy a few more thrift store finds, though some of them like the beautiful bird of paradise framed print were a measly R10 (under a $1) from our local church fair! Over the past few weeks I have been constantly moving things around until yesterday when I felt 100% happy and committed to drilling several holes into our brick work. 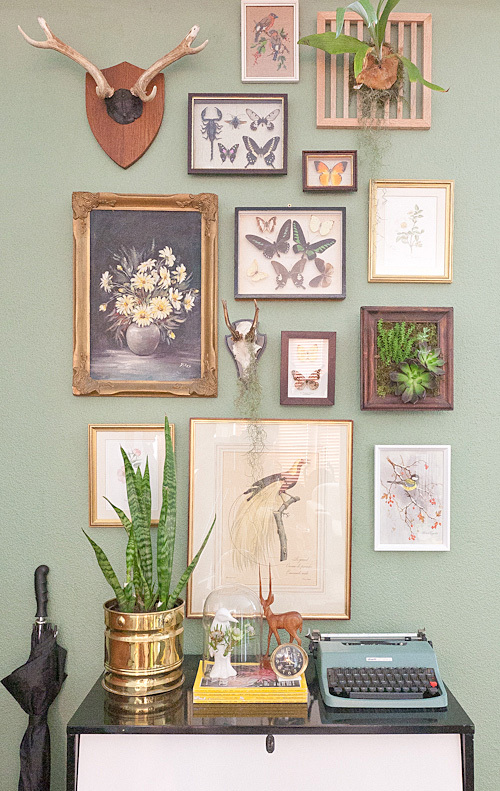 The wall has taken on a natural history feel, the precedent was set by the various framed butterfly prints that remained from the original design, but I’m in love with it and makes the house feel more like a home. 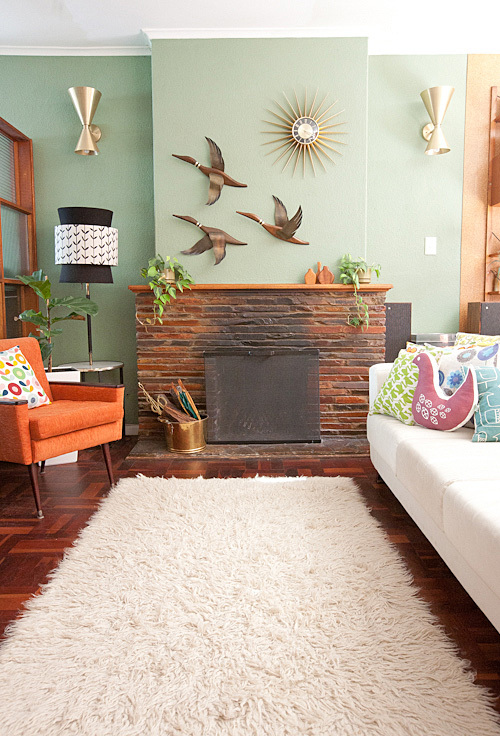 You may recall that that wall used to be the home to a trio of mid-century masketeers ducks, well they migrated to the fireplace wall above out mantle, which has also been stripped down to a few bare essentials. So I’ve been able to successfully complete one of the 4 goals, I’m also making headway with another, to read more, look less and completed my first novel, at least one more to read before the year is out. Wowee that natural history wall is absolutely stunning! Hi, I know it’s been awhile since you posted this (I found it through pinterest), but I’m dying to know what color of paint the walls are. Hi Michelle, the paint colour is called “City of Green” and is manufactured by a local paint company called Plascon. The have an on-line chart and iPhone app you can download and have it matched to a paint if it’s unobtainable in your country.